Libros: Programa de lectura de verano y otros eventos. Un evento sucedido en la Seattle Public Library, diseñada por Rem Koolhaas y OMA, con el objeto de promover la lectura en los ciudadanos dentro de su programación para este verano. Se trata de una iniciativa para hacer una cascada dominó que resultó ser un récord mundial utilizando por supuesto libros, una enorme cantidad de ellos (2,131) a manera de piezas de dominó. ¿Quieres verlo? Además podrás ver también, si es de tu interés, la programación de verano de la Biblioteca, muy interesante para todas las edades y varios idiomas: Summer Reading Program. Otro evento sobre libros: ¿Conoces la OMA Book Machine? Ó, How Rem Koolhaas re-engineered the architecture book. The Dutch architect’s practice OMA is so prolific with research that it’s rumoured to produce a book a day. So what’s behind this preoccupation with publishing? A 40,000-page book binding together 35 years of writing by architects OMA is on show at the Architectural Association in London. Often these titles tend to be monographs. Light of text and glossy of photograph, they are hefty volumes, records of achievement – a chance for the architect to say “Look on my works, ye mighty, and leave them casually stacked on the coffee table”. But Rem Koolhaas’s books, produced with his Rotterdam-based practice Office for Metropolitan Architecture, are different, as a new show at the Architectural Association School of Architecture in London’s Bedford Square demonstrates. On a plinth in the middle of the room sit 400 volumes bound together in black folders. 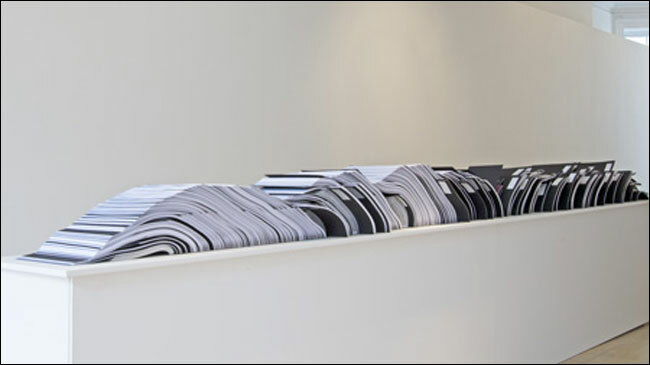 They look like endless meeting agendas, but they are the complete works of OMA from 1978 to 2010. If you stood this object on the floor, it would be as tall as two people, one stood on top of the other. No wonder the show is called OMA Book Machine. For Koolhaas and OMA, books aren’t luxuries – they are the residue of a process. These are architects trained to think and work through books as just another material, like concrete and glass. The vast amounts of research regurgitated by the OMA machine gets sifted and refined in book form, keeping the method transparent and the information easy to re-use. Nothing is ever wasted, and in that sense there is no such thing as failure. If the research doesn’t turn into a building, there’s always the book. Oma Book Machine at the Architectural Association in London. Jamás olvidaré, sin echar de cabeza a nadie, cuántas veces he oído de insignes arquitectos aquí en México, que como arquitectos se les da mejor lo visual, porque es lo que tiene qué ver más con la arquitectura; por ello, la música, la lectura y la escritura, no se le dan bien, y según sus palabras no mostraron gran interés por ir a conciertos, ni por leer y muchísimo menos por escribir. Pues ya ven que no es así estimados colegas (y no colegas también). ¡Para empezar hay que ponerse a leer y a escribir! No debe ser un problema, fue aprendido desde la infancia. Y por otro lado, aprender a escuchar música es muy placentero y ¡ayuda tanto! (Copland, Aaron, Cómo escuchar música, FCE).